It seemed the worse Hillary Clinton did on the campaign trail, the more interesting former President Bill Clinton’s expressions became. Yesterday, he watched as his wife announced she was “suspending” her campaign. The former president on Saturday. 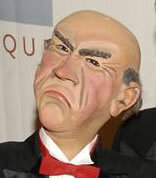 “Walter,” the Jeff Dunham puppet. Now to the pithy analysis. The Baltimore Sun says there was an air of “inevitability” surrounding Mrs. Clinton, suggesting her bid to claim the vice presidency is meant to keep other women candidates at bay in 2012 or 2016. So what undid her candidacy, which a few months before the Iowa caucuses appeared to be a coronation? Citing the early ’90s advice of Sally Quinn, according to the LA Times, the Clintons learned to run against inside Washington to get in, and become inside Washington to stay in. Bottom line? She was too inside Washington. The Vancounver Sun finds a less analytical approach in its analysis. Too much confidence, too little good strategy. It had to be very disappointing for the former president.